Thirteen free workshops with local experts: Learn useful tips and tricks to make your life greener and healthier! Full Workshops Schedule, including descriptions, will be available the day of the Festival at the Welcome Tables in Ridgway Visitor Center, Monsanto Hall and at all Presentation areas. Thank you to our Workshops Sponsor Spire. Presentations are approximately 20 minutes long. 10:30 a.m. Sustainable Furniture: To Preserve & Provide Futures? 1:30 p.m. Is Solar Right for You? Presentations are approximately 45 minutes long. 10 a.m. Can I Be Composted? 3 p.m. Recycle with Confidence! Learn about the benefits of keeping chickens, how to care for them, and how they can contribute to a more sustainable lifestyle. 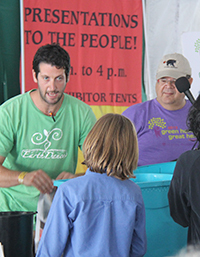 Enjoy a fun and interactive presentation by a compost-lover! Participants can ask questions and learn the benefits of backyard composting and how it differs from commercial composting - including tips on how to compost your kitchen scraps (Step one: don't throw them in the trash!). Get dirty and leave feeling refreshed and well-aerated with knowledge. The Energy Footprint Project aims to connect you to local organizations to conserve energy, resources to plant a native plant or vegetable garden, and educational opportunities to learn how to drawdown your carbon footprint. Find ways to provide for yourself and community without diminishing the planet. Learn low and no cost ways to make your home or apartment more energy efficient – from changing behaviors to changing out light bulbs, Nick will cover all the bases to show you how to save money, make your home more energy efficient, and reduce your carbon footprint. How do you decide if solar energy is right for you? Join us for quick solar lesson to find out if your home or property is right for solar and what incentives are available in your area. Learn about the benefits of kombucha and how to brew your own. Samples included. Hear a case study about how Chris helped a client get the healthy home she was searching for, and learn what choices you can make for your own comfortable, durable, efficient, and healthy home. 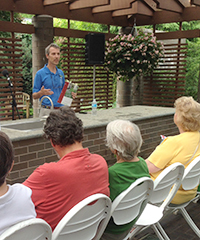 Join Stuart and Kristin for a healthy grilling demonstration. They will prepare a vegan, Hawaiian style Tofu Musubi Sandwich with pickled vegetables. Samples and recipes provided. Courtesy of Spire. Your small steps to reduce, reuse, and recycle can make a BIG IMPACT! Come learn about how St. Louis is working together as a region to develop a simplified recycling message for all our residents. Go home empowered to take recycling action in your home and your community! Come join us as we discuss a variety of plants and herbal preparations to help you glide through the summer months with ease! We'll touch on topics such as seasonal allergies, staying cool in the summer heat, and keeping those pesky bugs at bay, with some DIY recipes for you to take home with you. Connecting with plants is a proven way to increase your quality of life, whether it's through improving indoor air quality (houseplants), nourishing your body with homegrown food (edibles) or positively contributing to our local ecology (native plants). Learn about a range of easy to grow plants that will help "awaken" your senses and enrich your life! Get tips from local brewer on how to drink your way to a greener future. Samples included. Sustainable Furniture: To Preserve & Provide Futures? Learn about how Anew Nature saves felled Missouri timber from landfills and mulch piles, instead using this resource to teach job skills to previously incarcerated St. Louisans. The result is gorgeous and sustainable custom furniture for homes and businesses throughout the country.